Giving the devil his due this Halloween, FOX has ordered a full second season of its Lucifer TV show. Because in its first season, Lucifer premiered at midseason, originally, the network only ordered 13 episodes for season two. Now, Deadline reports FOX has just picked up the back nine, therefore giving the show a full 22 episode season. Tom Ellis, Lauren German, Lesley-Ann Brandt, Rachel Harris, Kevin Alejandro, DB Woodside, Scarlett Estevez, and Tricia Helfer star in the horror/black comedy series. 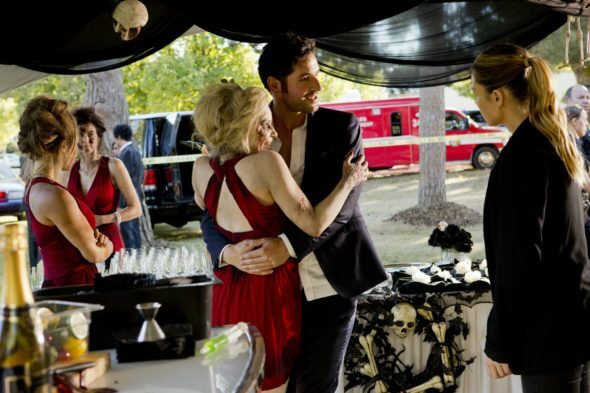 “Lucifer continues to deliver, with great blasts of dark humor and ambitious storytelling. The show has turned out to be a true wicked pleasure, the perfect companion to Gotham, and we couldn’t be more pleased to order these nine additional episodes,” said Fox entertainment president David Madden. What do you think? Have you been watching the second season of the Lucifer TV series? How many seasons do you expect it to run? Let us know, below. I think it is one of the best shows out there. It’s interesting and I love this show. I’m following from season 1 and haven’t missed any episodes. Can’t wait to see it back in may. As for the season 3, I think it should have one. I thought that the show was brilliant, funny and mysterious. It made me smile every time I saw it !!! It is my most favourite show that has ever been made . I love this show and never miss an episode. One of the best shows on TV and the all of the actors are outstanding. Please keep this show on TV. I can’t wait until May when it returns! Best show out there!! Blacklist was my fav but it’s now second. Honestly have gotten sooo many people to watch it. Ratings would be higher if Australia put it on free to air, Netflix or fetch tv. It only plays on Foxtel, on a Channel hardly anyone watches . I brought 2 season 1 dvds and I literally pass them around lol . Lucifer is a great and wonderful show with dark humor. Overall I love the show and I hope they make many seasons to come and blow our minds like the first seasons. Lucifer we love you so keep it coming. It is a great show and well done. I hope it has a long run. I absolutely loved Lucifer. I watched both seasons and each episode makes the show and all of its great characters grow on you. The dynamic between Lucifer and Chloe is great, along with Linda and all of her patients. I’d be heart broken if the show doesn’t continue for more seasons. Please renew we all love this show. It’s quite unfair how they calculate the viewing numbers with our busy schedules it’s not always possible to watch live or immediately! My hubby and I both love this show! We DVR and watch it about a half hr to an hour after it actually starts, so that our children are asleep and we can watch without interruption. I know a lot of our friends and co-workers watch online/amazon, which I guess doesn’t do anything for FOX and the ratings, but so you know that we are watching and do love the show! PLEASE keep on air and do a full 22 episodes for the third season!